Separate security alerts in and around Paris have marred the final day of campaigning ahead of Sunday's French presidential election. A suspected radical Islamist possessing weapons and a pledge of allegiance to IS was arrested north of the capital. 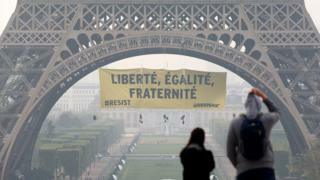 And Greenpeace activists scaled the Eiffel Tower to unfurl a banner, sparking an emergency police meeting. Centrist candidate Emmanuel Macron will take on far-right rival, Marine Le Pen, in Sunday's final round of the poll. 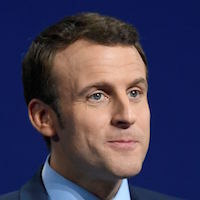 Various opinion polls have suggested a lead of 20 percentage points or more for Mr Macron. Why is France's presidential election so important? The man arrested in Evreux, west of Paris, was a convert to Islam who had been under close surveillance since 2014 because of radicalisation. Le Monde says he is a 34-year-old former soldier and was detained near an airbase. A USB stick with a pledge of allegiance to so-called Islamic State, a copy of the Koran and IS flags were found in his car, sources said. Two revolvers, a shotgun and ammunition were later found hidden close to the base. Three days before the first round of voting on 23 April, police officer Xavier Jugelé was killed by convicted criminal Karim Cheurfi while on duty on the Champs Elysées. IS claimed to be behind that attack. France is still under a state of emergency brought in after the Paris attacks of November 2015. Police were forced to admit flaws in procedures after the Greenpeace activists scaled the north face of the Eiffel Tower to unfurl a banner reading "Liberté, égalité, fraternité" (Liberty, equality, fraternity). The hashtag "resist" was also written in opposition to Ms Le Pen. "We wanted to say we are against the rise of nationalism and authoritarianism in France and in other countries," Greenpeace France's head, Jean-Francois Julliard, said. After an emergency meeting, police prefect Michel Delpuech said: "Above and beyond the motives, this publicity stunt, in the current climate, exposes faults in the security arrangements at the Eiffel Tower." About a dozen Greenpeace activists were arrested. There was high security around Ms Le Pen too, as she campaigned in Reims, where she appeared to have to protect herself from missiles as she was driven away from the famous cathedral. An angry tweet later accused her rival's supporters of a lack of dignity in a sacred place. Image caption Marine Le Pen tweeted: "Monsieur Macron's supporters act with violence everywhere, even at Reims cathedral, a symbolic and sacred place. No dignity"
A day before, Ms Le Pen had been pelted with eggs in Brittany. There were other violent protests against both candidates in Paris earlier this week and on Friday students blocked schools with rubbish bins and slogans saying: "Neither Le Pen nor Macron." Mr Macron spent his final day of campaigning in Rodez, in the south. "Madame Le Pen is the voice of nothing, she exploits anger and hatred," he told RTL radio. The polling average line looks at the five most recent national polls and takes the median value, ie, the value between the two figures that are higher and two figures that are lower. Mr Macron and Ms Le Pen came top of the 11 candidates in total who participated in the first round of voting. 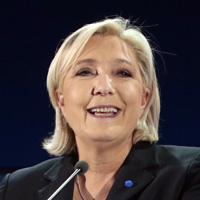 While the outcome of Sunday's second round should be clear that evening, the results will be officially proclaimed by France's constitutional council on Thursday, 11 May. Sunday, 14 May, marks the end of outgoing President François Hollande's term, and is the latest possible date for the inauguration and official transfer of power to his successor. You can follow the French election on the BBC News website. Click here for all our latest coverage. On the day of the election, we will be running a live page bringing together the latest news, video and analysis. On TV, you can watch a BBC World News Election Special, from 18:30 BST (17:30 GMT / 19:30 local time in France) on Sunday, which will be broadcast on BBC News in the UK and on BBC World News internationally, with Christian Fraser presenting from Paris. For radio, BBC World Service will broadcast a special extended edition of Newshour from Paris at 18:00 GMT on Sunday.